Browse places to stay in Phong Nha on Booking.com. Book Now - Pay Only When You Stay. Two well-marked (and rubbis- free!) 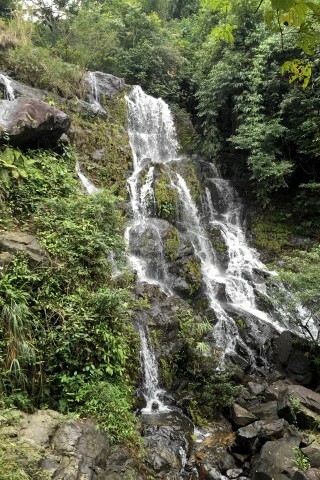 trails lead through the forest and one of the highlights is modestly sized but picture-perfect Thac Gio Waterfall. You can ask for an English-language map and you’ll be asked to sign in, always a good idea when hiking alone, though you really can’t get lost if you stick to the path. The tropical forest is beautiful, and different species of plants are marked with signs. Keep your eye out for orchids and birds. The hike is especially refreshing during the cold months of December to February. Points of interest include an animal rehabilitation enclosure, 100-year old Sao trees and Thac Gio, a 30-metre waterfall of clear, cold water. A refreshing splash under the cascade would be just the ticket on a steamy hike. This part of the trail requires some bouldering over slippery rocks, aided by a rope handrail. Wearing grippy soled shoes or sandals is ideal. Route 1, the short route, is 1.5 kilometres. We were told it would it would take one and a half hours; we easily finished it in less than an hour. The longer Route 2 is 2.5 kilometres. If you just want to see the waterfall, simply walk there and back, it’ll only take you 20 minutes. For a laugh, step into the display centre for a gander at the few dried leaves, random rocks and a horrendously bad diorama of fake animals. From the town entrance (the turnoff from Ho Chi Minh Highway East heralded with the big “Hollywood” sign), drive 4.5 kilometres to reach the left turn for the road into the park. Admission: The park is free to enter; pay for each attraction. The admission for the Botanic Garden is 40,000 dong, 5,000 dong for motorbike parking.